Republicans swept the board in the general election of 1918, consigning the constitutional nationalist Irish Parliamentary Party to history. The decisive electoral victory was also a clear declaration that people, in their droves, had abandoned the minimalist demand of Home Rule and now sought a Republic. At the outset of 1919, what are often considered to be the first shots of the Black and Tan War were fired by Dan Breen and his comrades at Soloheadbeg, Co. Tipperary. As armed actions intensified in the months that followed, the Dáil moved to officially establish the Dáil Courts on 18 June 1919. The courts began to function effectively towards the end of the year. In North Co. Dublin, Thomas Peppard, Intelligence Officer in the Fingal Brigade IRA, later documented how “the courts were well supported by the people and the British Petty Sessions Courts and suchlike were almost completely deserted”. Sean M. O’Duffy acted as Registrar for the Courts for the South City of Dublin from their inception in 1919. He described how the courts were held in various places, but particularly at 41 Parnell Square, and “usually at night”. Judges were appointed and plaintiffs, defendants and witnesses called. Many of those who were central to the day-to-day running of the courts were IRA members and the risk of raids and capture by the crown forces was constant. According to O’Duffy, all types of offenders were brought before the courts, including “dairymen who had put too much water in their milk before delivery”. Many of those convicted of more serious offences were deported. Most cases, however, dealt with “processes for civil bill” - i.e. non-criminal claims by plaintiffs regarding finances or property against the defending parties. 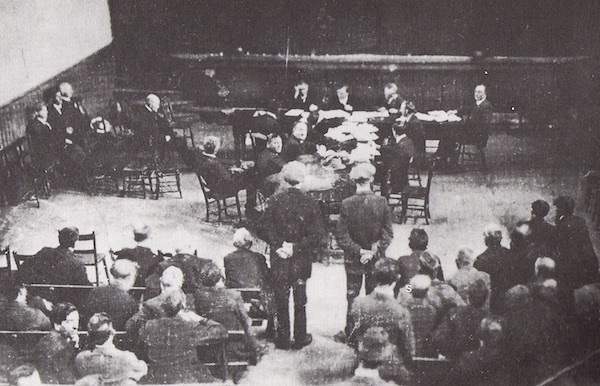 The courts in Dublin operated secretly at first, but by the time of the Truce in 1921 they begun to operate openly. Their headquarters in the city by then was at a premises on Wellington Quay. By late 1921, O’Duffy was full-time organiser for the courts in south Dublin and surrounding counties. At that stage, the courts operated on a basis of broad participation by different sectors of society. In theory, at least one TD, local Councillors, members of the republican movement from Sinn Féin, the IRA and Cumann na mBan, as well as trade union representatives, and a cleric of each denomination, were to take part in a local court’s proceedings. The courts were organised throughout the country at the parish, district, circuit and supreme levels, depending on the seriousness of the offence. Some of the titles of these courts might jar with republicans and other activists today. For among the lineal descendants of these courts in the Twenty-Six County state corruption and classism is rife. Nevertheless, the Republican Courts of 1919-21 fulfilled a vital role during the Black and Tan War. “...when Republican Courts have been established ... and they are in a position to deal with all the cases coming before them, attention must be turned to the enemy courts. They must be rigorously boycotted... any person who takes part in the proceedings of an enemy Court ... will be deemed guilty of assisting the enemy in time of war”. The idea was to first of all win the trust of the people by acting as mediators of their daily, and often minor, legal troubles. The second objective was to remove a key pillar of the British state in Ireland, namely the administration of “justice” at the local level. The sense of autonomy and grassroots democracy created by the Dáil Courts was vital in maintaining a vibrant republican movement, which was ultimately able to bring the British Empire to the negotiating table. There is plenty that we can learn today from the history of the Republican Court of a century ago.